First there was Eco2pure then wood chips and sawdust. This simple filtering process removes soap and glycerin. The Airwash process evaporates the methanol by passing large volumes of air through unwashed biodiesel. Once the methanol has evaporated, the impuries settle out. A number of ION exchange resins are available to purify biodiesel. Different manufactures have taken slightly different approaches. Most of these beads will remove soap, but will last longer if soap levels are kept low. Sunbreak Bioofuels posted this dry wash resin tower design on the Infopop biodiesel forum. 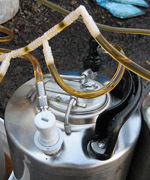 It's a simple way to make ion exchange towers using cornelius kegs. No welding required. Drywashing with Magnesol was one of the first methods of purifying biodiesel without using water. It also does a good job of polishing biodiesel.